i have a story. a short 'book', if you will. 60 pages of single spaced madness. i haven't yet dared to let my wife read it. I used to have a rambling journal on my laptop. I would just write when I was mad, upset, happy, didn't matter. Just kind of a way for me to try and get a grip on my free range insanity. It was all for me, not intended for anybody to see. Well the wife found it one day while snooping on my computer. It was a good fight. I stopped doing it when I realized that private thoughts have no place in my life anymore, since they are "not allowed"
spicy. the overwhelming taste is that of malt and cloves. the undertones are pit fruits: cherry and prunes. mild carbonation, perfect temperature. perhaps a bit too much tannin. 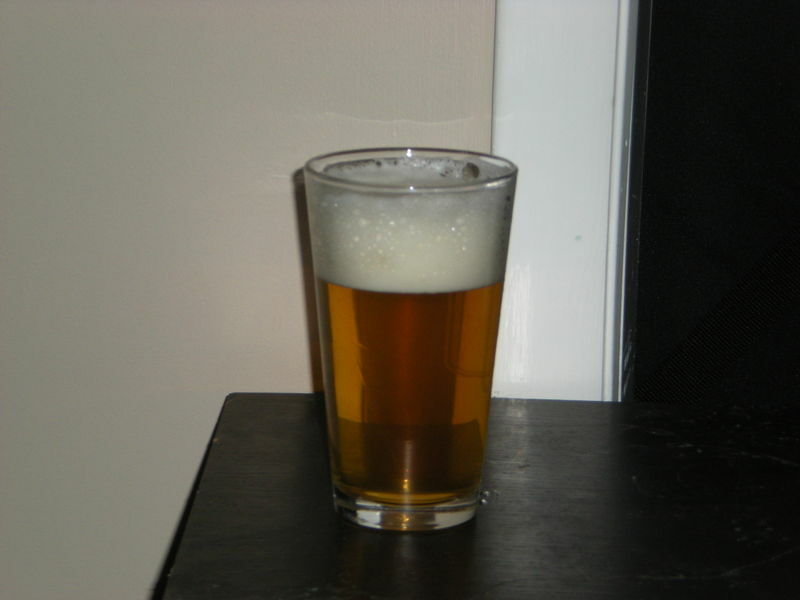 a rocky head, with proper belgian lacing. Bubba's going to crap in your shoes when you are not looking. my wife, if she read this without my permission.... well, i don't know what i would do. it would be unpleasant. i would be three shades of pissed and no concern for consequences. i would be three shades of pissed and no concern for consequences. Hence the reason I drink no more. i name my cats after movie bad-guys. don't get me wrong. i am a happy and pleasant drunk. but betrayal and snooping throws that right out the window. if any of you all wish to read said autobiographical diatribe and self-indulgent history of chemical excess, let me know. i'll send you a hard copy. i could use some literary criticism. I used to be a happy drunk, then it turned, slowly, into something very dark. I actually disarmed a cop one night, because the neighbors call on me. I don't know what stopped me from killing him. I am usually an easy going guy, but since alcohol is a mood enhancer, and my mods tend to have an undertone of stress to them, it is best I stay dry. That and my daughter would kill me if I ever touched a drop. Believe me, she can do it too. A product of my teaching to defend herself, and military training, she scares me. Sure, as long as you don't mind total strangers peering into your mind. You better wait till you are sober to make that decision though. pm me your address, i'll send you a copy. a friend of mine read it. he liked it. he witnessed a large part of it. i have a darkside, but it tends towards humor and self-deprecation. i am too easy-going for my own good. i tend to behave as if everyone were the same and sometimes end up offending folks. Most "home brews" I have seen/had have stuff floating in them. Very nice coloring, it presents a nice head. I've brewed a little. Not easy at my current place. I'd like to do it again someday. tell me about your place. i can tell you how to brew anywhere, under any conditions, and produce good, bragging rights, beer. I should do it again, I live in a townhome and I share two walls as well as close quarters to other units. It's the smell of the initial brewing that I worry about. I stank my place up pretty good. I also need to find a bigger pot. Mine was to the rim. not sure what the problem of the initial smell might be. i lived for 8 years at an apartment, while brewing beer. the smell was never a problem. what were you doing?! you can do this with a 12 quart pot. no kidding. and turn out really good beer. a 20 quart or larger pot is more ideal. but, you work with what you have. are there temperature issues, or anything else that may affect the final product? Final product was just fine. It did not smell bad, just the overwhelming smell of brewing beer. I just try to keep quiet. It is amazing just how many places this dog wanted to go.